Journalist and author Michael Petrou includes Garner’s remark in his 2008 book, Renegades: Canadians in the Spanish Civil War. After summarizing the political reasons for the conflict, he surveys the social, personal, and economic reasons for joining up. A lot of Canadian volunteers, he writes, were first generation immigrants struggling to establish themselves in a country reeling from the Great Depression. Veterans of logging, mining, and relief camps—as well as farm bunkhouses, hobo jungles, and urban flophouses—many led restless lives, moving around Canada looking for work and a shot at security. They tended to be older, tougher, and poorer than volunteers from other countries, with less formal education and a weaker sense of roots. Some saw enlistment as a way out. The majority, however, also saw joining up as a way to fight fascism. Many had experienced right wing oppression in their home countries or exploitation in Canada, and the Spanish Civil War offered a chance to fight back. Few started out as communists, but many were drawn to left wing politics over time, radicalized by their experience and, in many cases, by the Communist Party of Canada, the group most sympathetic to Canada’s working class. Recruitment for Spain was the CPC’s job, and it provided suitable volunteers with political theory as well as the networks and cash needed to reach the war. Canadian volunteers tended to be hard-working, pragmatic, and independent rather than doctrinaire and compliant. They varied, as Garner says, but in the main they were practical, resourceful, and used to making do on their own. At the same time, they cared about Spain and opposed the Nationalists’ attempt to bring down the democratically-elected left-wing government of Manuel Azaña. Many were idealistic if not rigidly ideological and shared a willingness to risk everything for liberty, social justice, the defence of democracy, and the defeat of Nationalist leader Francisco Franco and his allies Hitler and Mussolini. They were ready to serve the Spanish cause, and hundreds died doing just that. In mid-1937, communist organizers formed the Mackenzie-Papineau Battalion, named after the leaders of the 1837 rebellions in Upper and Lower Canada. Until then, Canadians had joined American units or battalions raised in other countries. Fresh volunteers from Canada now had a Canadian formation in which to serve, though battalion membership remained mixed, with some Canadians in American units and some Americans in the Mac-Paps. More than 1500 Canadians volunteered for service in Spain, including nine women. Various sources give different enlistment and casualty figures, but the mortality rate in Spain was much higher than that of Canadian soldiers in the First World War. By late 1938, early 1939, the war was all but lost and the International Brigades disbanded, but many veterans found it hard to make their way home and pick up their lives. Rejection and mistrust were routine, even when it was clear that the Republican Army and foreign fighters had been the first to face German Nazism and Italian Fascism. In Canada no recognition followed, no veterans’ benefits, no official respect or support. Many veterans found it best to bury their service.
. . . the Mac-Paps decided that this cause was important enough for them to face the anger of their own government; to face the consternation of many of their fellow citizens at that time and for decades to come; and to face a life afterwards in which very few people would take the least interest in the kind of idealism that had sent them to Spain in the first place. They were fighting for an ideal. They were fighting against fascism, which was like a rehearsal for the war to come. Several veterans were still alive at the time, but only three were well enough to attend the ceremony. Paivio, who had volunteered for Spain while still a teenager, had lobbied for the memorial and, as an architect, oversaw its eventual design and completion. The last of the Mac-Paps, he died in 2013 at the age of 96. The Mackenzie-Papineau Battalion was both an actual unit and a “collective designation.” In other words, any Canadian who volunteered for Spain is referred to as a Mac-Pap, whether or not he or she served with the battalion. Similarly, all volunteers are listed on the memorial wall, regardless of the role they played, many with a small cross beside their name. 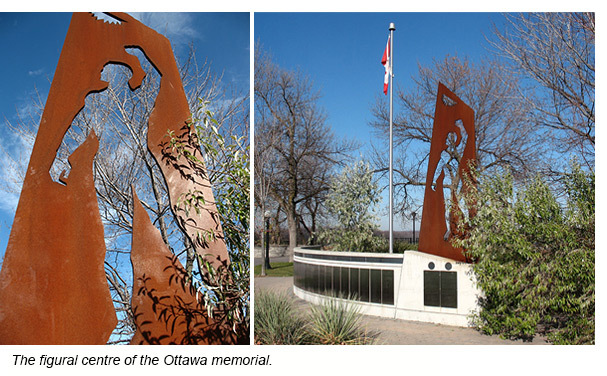 The memorial is in Green Island Park, Sussex Drive, near Ottawa’s city centre and along the Ottawa River. 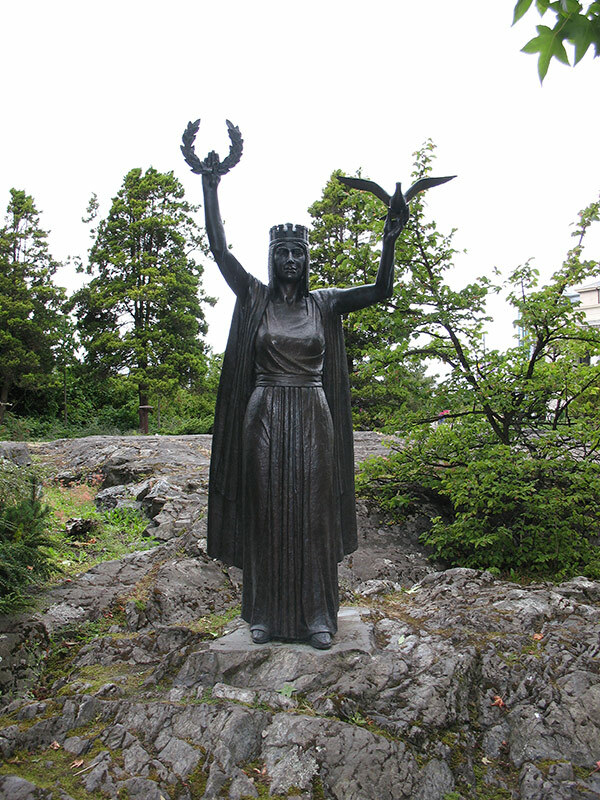 The sculpture works as both myth and history. As myth, it recalls Prometheus, the Greek Titan who defied the gods and stole fire from the heavens so humans could have light and warmth. As history, it suggests a Republican soldier or foreign brigadista giving the clenched fist salute and vowing No Pasaràn, “They Shall Not Pass,” the declaration that fascist forces would never take Madrid. As for the steel itself, its red finish brings to mind the soil of Spain, or perhaps blood; and the metal, cut to create the silhouetted figure, reminds us of the pathetic thinness of second-rate armour plating. There are plaques commemorating the Mackenzie-Papineau Battalion in Toronto and Winnipeg, and, since 2000, a memorial to the Mac-Paps on the grounds of the Legislative Assembly of British Columbia. The following photos were taken there.